In 1989, Linda and I moved to Montana with a dream of establishing an education and retreat center. Free from the accumulated clutter of standard American living and the confines of religious dogmas, we began to explore philosophical approaches and lifestyles that mimicked nature and our inner prompting. With our 1983 Nissan 4X4 and boxes full of books by Scott and Helen Nearing, Emerson, Muir, Fukuoka, the Desert Fathers, Krishnamurti, and others, we left the conventional world for the land of uncertainty. Shouldering an awareness of our pioneering ancestors who often approached the West with a “divide and conquer” mentality, we quietly vowed to live in a new way. After one year of searching Montana for the right piece of land, we finally signed the contract and a sense of relief overcame us. This feeling was quickly overshadowed by a sense of tremendous responsibility. In many respects, the best way to tread lightly on the land is to not tread; stay in a city, get rid of the car, and leave the wilderness alone. However, Linda and I decided that if we did not purchase this land, it would be acquired by others concerned only with the view and building a conventional house. We decided to view the land as a teacher, an ancient sage with answers for those willing to listen. Realizing that every blade of grass that was stepped on altered this terrain, we established a 10 year plan. We used material on the land–wood, stone, topsoil, granite, sun, wind, and, so on–and built the shelter ourselves, as much as possible. We paid for the buildings as we went along. Linda provided consistent income as a nurse and I honed my fourth-generation construction genes to do the building. Initially, we needed water and a quick shelter. A used 16′ self-contained 1963 Aristocrat trailer became our home and we hooked solar electric panels to the trailer for electricity. 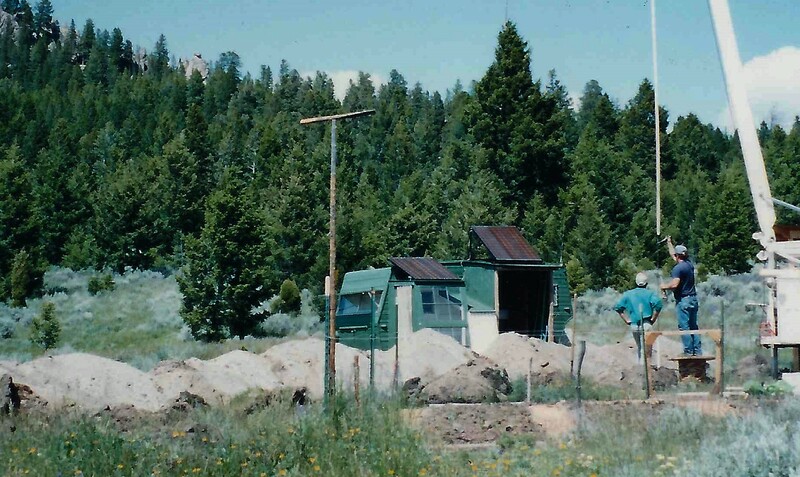 Eventually we drilled a well for water, instead of relying on a creek 1000 feet away. 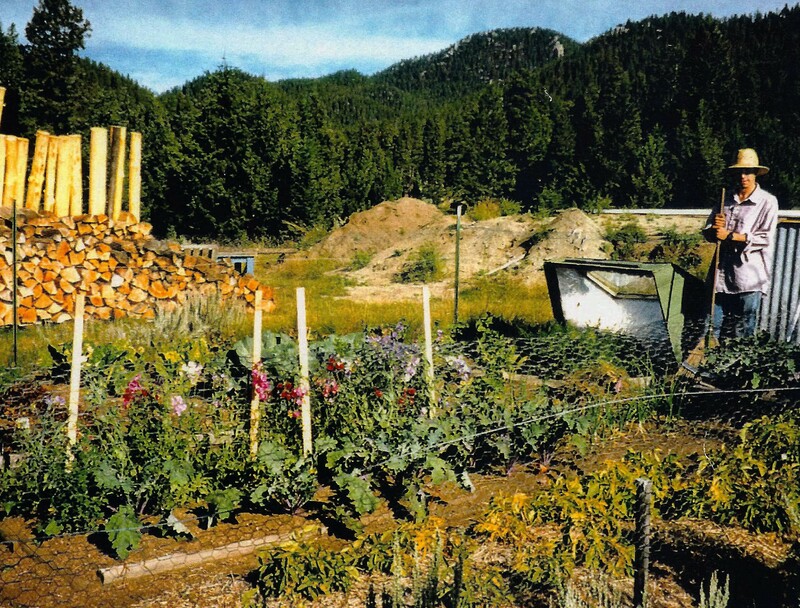 Our first practice cabin, Tilting Tree Cottage, was built using Cordwood construction and passive solar principles. Two years later the Guest House was built after learning from the mistakes made on Tilting Tree Cottage. With water for drinking and protection from the elements, we finally had a home in this mountain environment. We listened, watched, and learned about the songs and patterns of various birds, the tracks and droppings of unseen mammals, the weather patterns, and the flaming beauty of the mountain wild flowers. In the spring of 1993 while digging the foundation for the Guest House we unearthed a three-inch spearhead. This jasper spearhead along with an obsidian arrowhead that we later uncovered three feet below the surface was probably lost by a passing Native American hunter. Upon finding these relics I was immediately thrust back in time as I pondered the thousands of years it took to create the feet of topsoil needed to bury these ancient pieces! My mind was split in two. In 1996 we completed a third structure, the workshop/studio, honing alternative construction skills and refining our winter survival skills along the way. In the meantime, more and more people wanted to see our work. As interest increased, we opened our facility at regular intervals and eventually offered workshops. The workshops, tours, and programs continued as the Main House became the heart of Sage Mountain Center. The Main House now provides space for visitors, workshops, meals, recreation, and general relaxation. With the bulk of construction behind us, and the sweat, blood, tears, elements, travel, and calluses we experienced during our the first 14 years, we are well on the road of our original journey. And that journey is to encourage balance, inspiration, compassion, and inner freedom for those interested in this vision. Chris Borton is the co-founder and director of Sage Mountain Center.